Where relevant, the source document for the definition is indicated in brackets. • finally, a third group of terms may be misleading for non-native English readers, because similar terms have a different meaning in foreign languages. Within IEA SH&C Task 26 a comparatively large number of experts in this field have been working together. The amount of accumulated knowledge is extensive and the essence of it has been made available in this handbook. Nevertheless, there are huge amounts of background material available to those interested, some of it surely adding information of interest concerning the outcome of Task 26. The researchers of Task 26 have accumulated a list of references that may be of interest when studying solar combisystems, and these are given below. The standards for collectors and factory-made systems EN 12975-1 &2 and EN 12976-1&2, as described in Sections 10.2.1 and 10.3 respectively, will serve as the basis for a European certificate for solar thermal products. At the time of publication, the European Solar Industry Federation ESTIF and 13 test institutions representing 11 European countries are working together to establish the so-called Solar Keymark (see Figure 10.5). The Solar Keymark certifies conformity of solar collectors and factory-made solar domestic hot water systems with the European standards (Nielsen, 2001). For determination of the thermal performance of small custom-built systems according to ENV 12977-2, the CTSS (Component Testing – System Simulation) method has to be used. 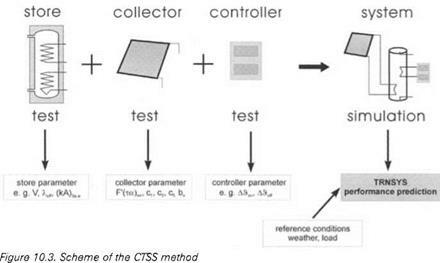 The CTSS method is based on separate tests of the most important components (see Figure 10.3). The test for the collector is carried out according to EN 12975—2. The store is tested according to ENV 12977—3. The controller is checked according to ENV 12977-2, Annex B. Based on the parameters determined for the different components, the thermal performance of the complete system is predicted by using a component-based system simulation program such as TRNSYS. and without auxiliary heating. It is therefore the most relevant test method for ‘typical’ factory-made solar heating systems used in northern and central Europe. The aim of the DST test is to determine a set of parameters, giving a detailed description of the thermal system behaviour in combination with a numerical system model. These parameters are determined by means of parameter identification using measurements recorded during operation of the system at a test facility. Annual performance of the system can be predicted by using the numerical system model and the parameters determined from the system test. The CSTG test method is based on a simple ‘input/output’ correlation and can only be applied for solar domestic hot water systems without auxiliary heating devices in the store. This method is standardized in ISO 9459-2. Since solar heating systems of this type are rare in northern and central Europe, the CSTG test procedure is predominantly applied in test laboratories in South Europe.